They say that there’s nowt as queer as folk, and welcome to 2019, your year of the weird and the wonderful, lovely Virgo, and of a few Cilla-esque surprise surprise moments! Now, before you start worrying about the disruption this might cause in your routine, we’re here to tell you that it’s a wonderful thing because the cosmic phenomena responsible, the eclipses, are actually in what a lot of astrologers deem the best part of the horoscope. Why? Because it’s the most creative, loving (yet detached when you have to be) energy that you’re going to be downwind of, and this is the year when you will either enjoy the benefits an expanded ‘family’ brings (the position of Jupiter also has a hand in this) or you will become part of a new extend ‘family’. Virgo yearly horoscope predicts that 2019 is also the year of you being moved to Leo when you don’t think something is fair because you’re a future agitator and you must see fair play, plus this is exactly the right environment that’s charged with the right kind of electricity for finding love. When we apply this energy to what you do for a living, if it’s not fulfilling you even a little bit creatively – and we know that not everybody can be ain a creative role, but you will need at least a modicum of this in your life this year – or the people you work with aren’t your friends, then you’ll be doing something about it. As for your friend-friends and your Facebook friends, you’ll be taking more of an interest in what’s going down in their lives and seeing them more in person rather than the odd text or social media ‘like’ or ‘love’, so you’ll be able to strip away all that social media gloss to see what’s really going on with them. This might involve the swallowing of some amount of pride, but someone’s always got to be the one to make the first move. And by directing your energy and interest outwards instead of inwardly, it’ll take you out of yourself and take your mind off your own worries. We mentioned getting creative and this can mean anything from taking up a hobby or a craft (homemade Christmas gifts? Making jam? Sketching a tree out of the window?) to encouraging the same stuff in your offspring. Jupiter’s energy brings luck in your domestic sphere and this might mean you upsizing where you live or finding yourself a place with more pleasant aspects, like all the brochures say, or your family will expand. If members of your actual proper family haven’t been on the best form lately or they’ve made you not feel good about yourself then this is the year when you may decide to detach or not put yourself in a vulnerable position where they can pull you down any longer. Sometimes going quiet speaks loudest, lovely Virgo. For a more personalised 12month forecast, based on your date of birth, get Your Personal Year Ahead Predictor here! 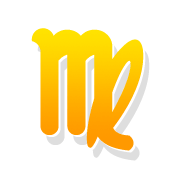 What does Virgo 2019 Horoscope hold for your love life? On the packet of some well-known vegetarian sausages is written the words ‘outrageously succulent’ and this describes your love life in 2019 to a T, lovely Virgo! Yup, you’re looking for a few wild and tasty times, and the type of excitement that you read about other people enjoying, instead of life trundling on in the same old direction! Jupiter’s influence will bring more self-satisfaction your way for starters because you’ll be giving out and receiving more love this year and being more demonstrative and less cagey about how you feel, fuelled by a ‘what the heck!’ attitude. Those eclipses we spoke about bring luck via socialising, plus there’s one in Leo too, so a connection that stems from giving a person a lifeline can also lead to love, or there could be some serious swooning going on near to the photocopier at work, or anywhere in the workplace for that matter. From the 27th of March until the 21st of April is when Venus will be in your opposite sign of Pisces, and this is when you may discover that a person really does have hidden emotional and romantic depths and that you can be bothered diving down to reach them. This is also a time when you might fall for someone or see them in a new light because you discover this person is sweet on you! But things really heat up in your Love Horoscope 2019, dear Virgo, in late August and early September, so just in time for your birthday then, because this is when both love planets do a seductive tango in your sign! They will conjunct on the 24th of August so this a bonanza time for love, plus this is when you’re at your most seductive. Venus departs your sign in mid-September but Mars is with you all the way until the 4th of October. Mars alone in your sign means that you might attract the Russell Crowe mean-and-moody type, with not much in the way of finesse about them, but who cares about finesse when you’ve got your own private gladiator to come home to every night! For most of September you will, therefore, be incredibly driven and ‘good selfish’ because you know what you want. Are you a single Virgo? Check out Virgo Single Love Horoscope 2019! Love Horoscope 2019 predicts that all you Virgos in relationships will also be feeling more confident in yourselves and this might mean you doing things independently of your love one as one in the eye for them, to prove that you can, or you might very well that you have to muster enough energy and enthusiasm for two if they’re all a bit lacklustre. But at the same time we very much doubt that you’ll be falling for the old helpless routine either because the more you do and the more you spoil you-know-who, the less chance there is of them ever getting off their backside and doing it. Select another sign: Yearly horoscope 2019 predictions.